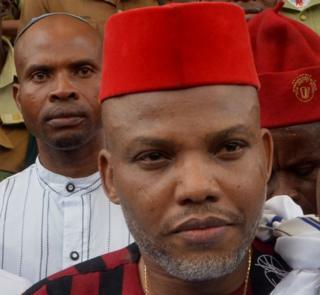 “I’m in Israel,” Mr Kanu said on Sunday in a broadcast on his outlawed pirate radio station – Radio Biafra. In 2015, Mr Kanu was charged with “criminal conspiracy, intimidation and membership of an illegal organisation” – charges that could amount to treason. “Should any other part of Nigeria wish to join Biafra they are welcome to do so, as long as they are Judeo-Christian… the value system that underpins Biafra,” he told the BBC last year. Mr Kanu said in Sunday’s broadcast that he was still pushing for a referendum to create a breakaway state in the south-east. He urged his followers to boycott next year’s elections in Nigeria unless the government agrees to the push for a referendum. “Ipob will liberate Biafra and we will not take part in any elections until we get a referendum, it is not negotiable, we will do it by any means,” he said. “I will be back soon in the land of Biafra and I will bring hell with me,” he said. “I owe my survival to the state of Israel,” he added, saying that he had been aided by Mossad, country’s spy agency, without elaborating how he was assisted.